The Three Stooges Movie: Misfire or Tribute? When I think of certain acts or characters I immediately associate the actors who created them or played them and brought them to life. The Little Rascals. Laurel and Hardy. Inspector Jacques Clouseau. The same with the Three Stooges. It doesn’t surprise me that the attempted updates to these long ago characters barely made a shudder with fans of the originals and were quickly forgotten about, while the originals endure. It’s a slippery slope for Hollywood. They’re about making money and attracting the biggest possible audience to pony up some cash to see a flick. The solution: fill the screen up with lots of special effects and ‘splosions. Or get ahold of a title that everyone is already familiar with and loves, redo it and try to hold back the crowds! I don’t want this to become a rant about movie remakes, although I could easily turn it into one! There are some remakes that I actually enjoy. Some films based on television shows I like. The Fugitive was a great action film and The Brady Bunch movie was pretty funny. But this is about The Three Stooges movie and if it was even a good idea to make in the first place. When I first heard the idea I was pretty cool on it. I, like a lot of Stooge fans, was skeptical about it. When the trailer was released and I got an idea of how it was going to look….any optimism I might have disappeared. That must have been one of the most poorly received trailers in recent memory. I didn’t hear much positive feedback from audiences based on it. It didn’t reach Jack and Jill type of sickness, but it didn’t get people bouncing in their seats saying “Oooh I can’t wait!”. Now having seen the movie, my fears were confirmed. I didn’t enjoy it and thought overall it was not only a disappointing Stooge film, but also a mediocre comedy. One positive thing I’ll say are the three actors (Will Sasso, Sean Hayes, Chris Diamantopoulos) all did a really nice job with their parts. 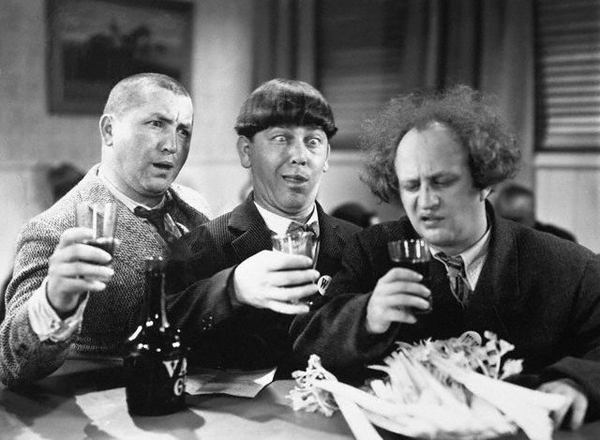 They all clearly worked hard to get the mannerisms, expressions and voices of the original Stooges down cold. The film could have simply relied on guys having the strange haircuts, but they did manage to capture some of what made the original guys so unique. Very nice job. Unfortunately, the rest of the film has lackluster laughs at best. The stars of the show are obviously the Stooges and if you’re not being entertained by them….well there’s not much else there. As admirable the intentions the Farrelly Brothers had wanting to bring the Stooges back – reintroducing them to a new audience, being huge influences on their comedy, just loving them so much – it’s not the same. At best it’s an adequate tribute act that unfortunately won’t inspire or add much to the world of comedy. And will probably make a lot of fellow fans roll their eyes in disgust. Those original Stooge shorts were perfect for their time. The era they were made in, the technical limitations, the physical humor and most importantly the performers! 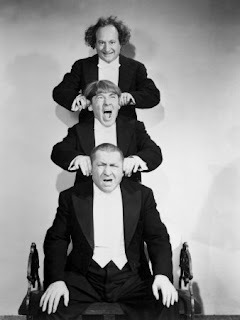 Moe Howard, Larry Fine and Curly Howard were the Three Stooges. (along with Shemp Howard, Joe Besser and Joe DeRita, although none of they’re pairings reached the comedic heights the more famous three team did). Sure, I’d say that the original Stooges are timeless comedy and will make people laugh today, but that doesn’t mean recreating it will work today. When I watch the original Stooge shorts I’m transported back to the time period in which they were made. They were coming out of the Great Depression, experiencing WWII, snotty socialites were horrified if you used the wrong fork, and dogcatchers actually ran around using big nets! And all the while there are three guys in the middle of it all slapping each other and messing up the simplest jobs. Trying to recreate the magic of those characters in 2012 with iphones and reality television references feels artificial and awkward. I don’t think I have much more to say about this Stooge film. I’m kind of grateful the wait is finally over with a new Stooge movie. No more curiosity. No more casting rumors. It’s done. Now we can see it. And now I’ll be forgetting about it….